AQT is on the cusp of commercial-scale solar production at a fraction of the cost and time of its CIGS competitors. What's remarkable about CIGS thin-film photovoltaics vendor AQT Solar is that they've gone from founding to the cusp of commercial production quickly and cheaply. While Solyndra, Nanosolar, MiaSolé and the other CIGS pioneers have spent money like drunken sailors, AQT looks like it will reach commercial production in two years' time -- and on less than $15 million dollars. Solyndra has probably spent that much on lobbyists, plane fare to D.C., and recruitment. AQT just announced the opening of a new facility in Sunnyvale, California that has already begun pre-production testing. AQT's first customer installation, Sol Pacifico, is a large property development that has ordered two megawatts of solar equipment to power its gated community in Baja Mexico. AQT’s new production facility, fueled by a recent $10 million round of funding, currently houses a 15-megawatt manufacturing line based on automated dry sputtering equipment from Intevac. It can scale up to 60 megawatts of production capacity in a very compact footprint within a year. The preparation, build-out, line implementation and qualification, and production initiation for AQT's Sunnyvale location took less than eight weeks. "That really bodes well for how this business scales," said Michael Bartholomeusz, AQT's CEO. “Starting commercial production so early in our company’s lifecycle is a confirmation of our business model, the leverage we receive from world class partners like Intevac and our breakthrough CIGS production process,” said the CEO. 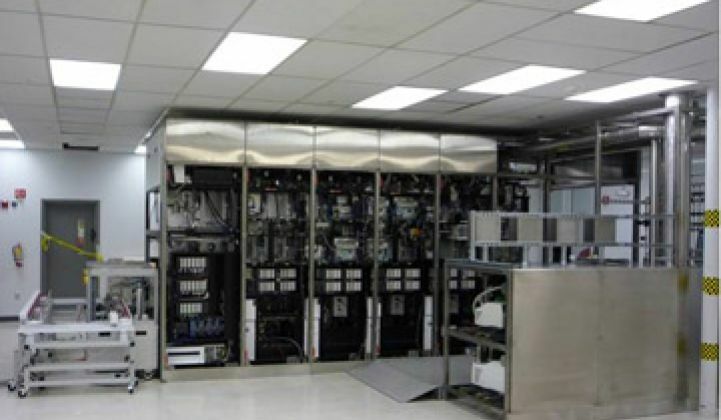 AQT is on the contrarian side of CIGS panel manufacturers -- they are not going after monolithic panels, but instead will manufacture "low-cost CIGS cells that are drop-in replacement for conventional crystalline silicon cells," according to the CEO. Bartholomeusz sees AQT at a similar LCOE to First Solar, while still maintaining a 50-percent gross margin. Getting to production quickly and inexpensively is huge -- but the price per watt for this company's product remains to be proven. AQT expects to add 40 green jobs over the next six months in Silicon Valley.